The Esther Honey Foundation clinic building. 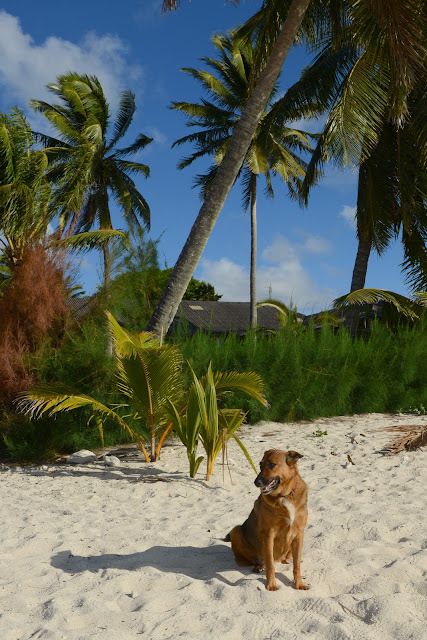 SAT relocated briefly and blissfully to the outrageously beautiful Cook Islands last week to meet the team of veterinary volunteers running the Esther Honey Foundation. (And if you're tempted to volunteer, let me just show you what is across the road). 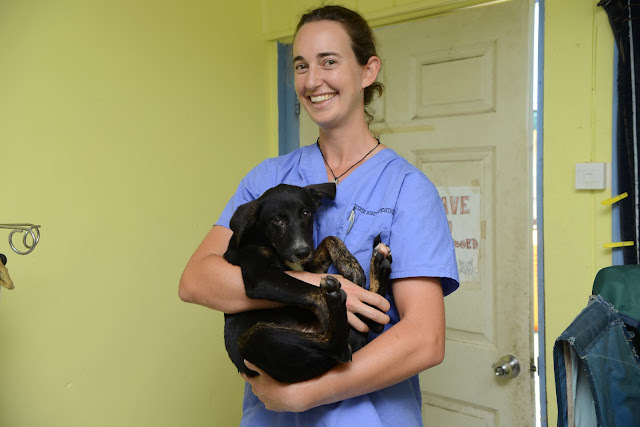 Michelle is one of a team of remarkable vets who give up their time to look after animals. 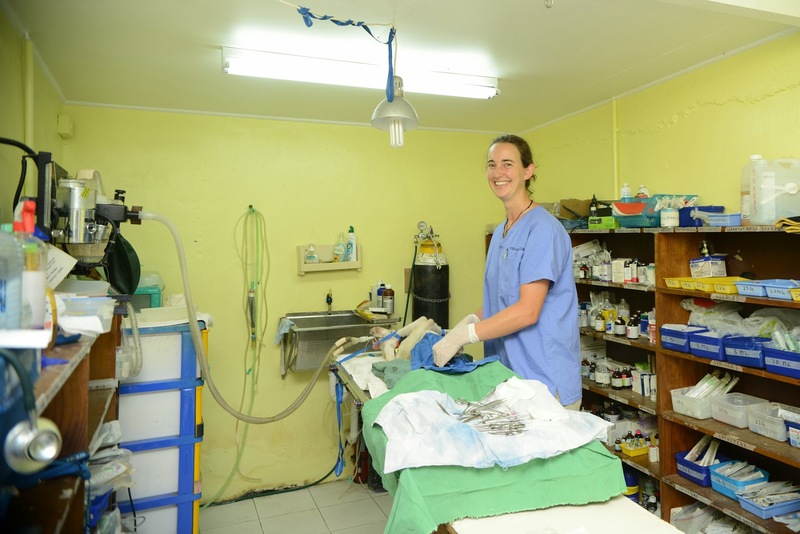 And though it might seem like all azure water and coconuts, staffing the only veterinary clinic in the country is hard (but definitey rewarding) work. SAT pulled up a crate and interviewed Michelle whilst she was performing surgery one morning. Dr Michelle Gray with patient at the Esther Honey Foundation. 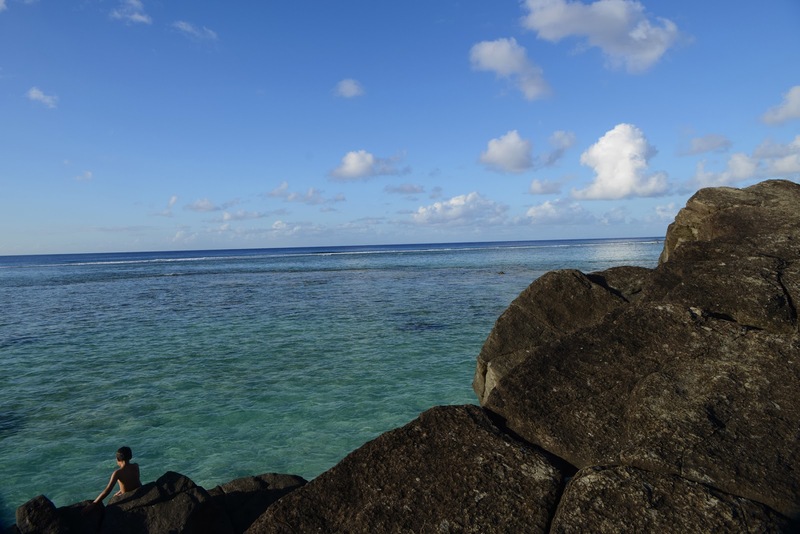 When did you graduate and how did you find yourself working on the Cook Islands? I graduated from Sydney University in 2006. My first job was in mixed practice in Wauchope, I loved it. I would have stayed longer except I got itchy feet and wanted to travel. I planned to travel for 6-12 months and settle back down with another permanent position, that was three and a half years ago. How did you hear about the Esther Honey Foundation? I heard about it when I was going through uni and thought I would come over when I graduated but then I was offered my first job and thought I would come over when I had a bit more experience. One of my friends from uni volunteered here and loved it, gave really good feedback about the organisation and island and said she had a great time. I always wanted to do volunteer work. The first time I came was October 2010, I meant to stay for two months and ended up staying for four because I loved it. Then I came back as the then Director had to attend a wedding overseas and I filled in for him. Since then I’ve been coming and going, and have been here for a total of two years of the last three-and-a-half years. When I go home to Australia I do locum work. Earlier this year the clinic director had to leave the island for health reasons. I knew how things worked and took over the role on a temporary basis so the US management could find a new person. Happily Amy, an American vet who graduated about ten years ago, was going to stay for six months but she’s interested in taking over the managerial role now. At the moment we’re doing a sort of hand over. 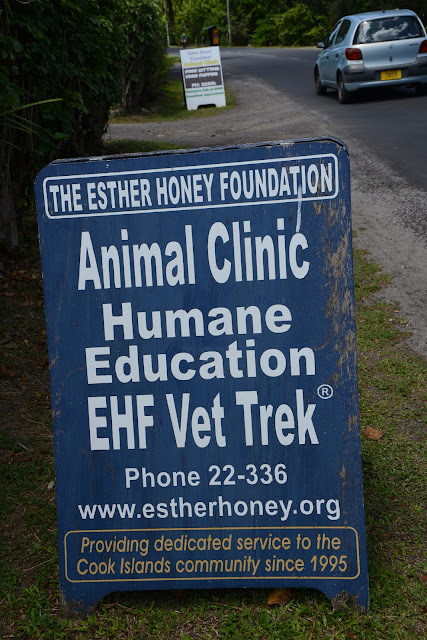 What does the Esther Honey Clinic do? The mission is to improve the health and welfare of animals by humane population control and education, and to provide low cost veterinary services for the animals of the Cook Islands. 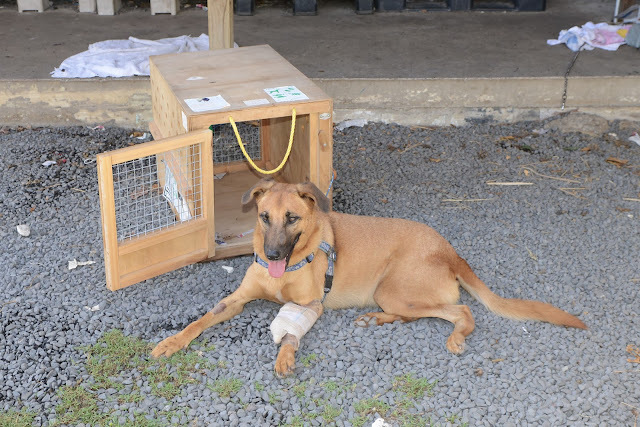 We also run vet treks where we travel to the outer islands and do spey/neuter programs to help control populations. There are no clinics out there so you do surgeries on picnic tables [using total intravenous anaesthesia] and verandahs and you get whole school groups coming down to watch. 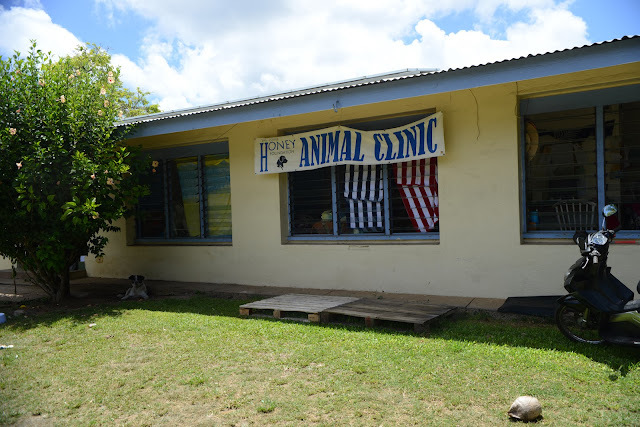 We also do education programs in the schools on basic animal care – the five freedoms, when to get veterinary care. The kids love it as we take a few kittens and they get to see animals. The sign outside the EHF. The focus is cats and dogs but being the only vet clinic in the country, when we get injured pigs or goats or wild birds we do try and look after them as well. At the moment we have three goats in residence. The main reasons we see goats are dog attack or tether injuries. We castrated 6 pigs the other day. We see a lot of dogs and cats hit by cars, dogs more than cats. All the dogs are free roaming and not all of them have road sense. A lot of motor vehicle accidents happen in the driveway. Also, animals will run out towards the scooters which is a problem for tourists who aren’t used to controlling scooters. We’re planning on running an education campaign to get people to tether their dogs, especially at dawn and dusk as that is when most accidents happen. We see a lot of broken legs, abrasions, pulmonary contusions and hips popping out. An orthopaedic patient wearing an external fixator recovers (NB the cage behind is not his cage - it just happened to be near). We also see fish-poisoning cases (due to ciaguatera). I had never heard of it before I came here. It’s only in the Pacific Islands and the Carribean. We see around 15-20 per year. We see a lot of skin cases. Fleas are a huge problem on the island. We’re always trying to get donations of flea treatments and we do end up buying some in. Flea treatment is one of the only things we charge for at the clinic as we can’t afford to give it away for free. The island is meant to be free of ticks. In 2011 we found the first ever ticks on the island, on a litter of pups in Arorangi and two other dogs had them. We don’t know where they came from. We sent them off to the Ministry of Agriculture and they identified them and have been keeping an eye out ever since. We treated all those dogs and puppies. They weren’t from the same area so it was a bit weird. How does the EHF charge for veterinary services? We offer veterinary services free to locals, and request they make a donation if it’s within their means to do so to help cover the costs. Some people are really generous, they might pay us by donating a giant bag of dog food and $200; others perhaps don’t consider the costs of providing veterinary services. We try to educate them about the costs of drugs and surgery. 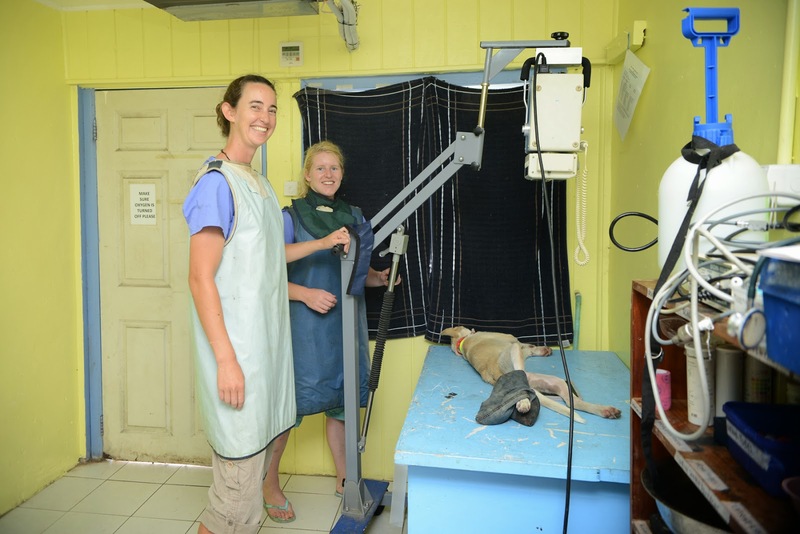 Michelle and Francesca prepare to take radiographs of a dog. Technically our work finishes at 5pm, we try to encourage people to leave the clinic and see the beach. Because we live on site the locals know that and tend to turn up when it suits them. One of the vets will always have an on-call mobile with them and people can reach that for emergencies. It is really variable how many emergencies we see. So just to clarify, the EHF is staffed by volunteers including yourself. That’s really interesting given that a lot of vets are concerned about low salaries. I get paid a living allowance and accommodation is provided, I have enough money for food and living. Compared to other professions the veterinary profession is underpaid, but I find the work here so rewarding that as long as we have enough to live on I don’t really care. I do the work for the animals. Is it all vet work or do volunteers work in other areas? Probably one thing people need to realise when coming to volunteer here, because we are a hospital and a shelter as well, there is a lot of feeding and cleaning and general nursing type work. Most people who come here are more than willing to do whatever is needed for the animals but we want to make sure they have realistic expectations. 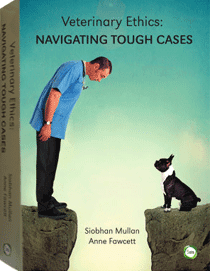 How can veterinarians and vet students help? There are a whole bunch of ways. Obviously coming over and volunteering is fantastic. [Volunteers pay their own flights and expenses]. Veterinarians and veterinary nurses can collect out of date supplies and talk to reps about donating supplies. There is a whole list of things we always need: bandages, flea treatments, suture material, basic day-to-day supplies. We can’t accept controlled drugs except when we order them, but we do ask people get in touch and let us know what is coming and we let customs know. We’re in the process of trying to formalise a VAT exemption so we don’t get charged tax. On the website we have a needs list that we update each month. hydrotherapy facility. Complete with tropical fish). How can pet owners help? Donations can be made via the website and spreading the word helps. You can follow us on Facebook. Even people coming here on holidays can get in touch with us if they are willing to transport supplies (especially if they are from Australia, New Zealand or even America) we can even arrange having things sent to them to bring over, as shipping is one of our biggest costs. If people can bring stuff in their luggage allowance it saves us money – and we’re close to the airport. What sort of skills have you developed in this job? I have learned to use just about every drug combination known to mankind. It changes from month to month what we have donated and what we have a lot of. So you learn to use different combinations and improvise with what we have got. The best thing about the vet profession is that you can email people and send photos and get advice from uni friends and lecturers. There is a lot of independent learning and study for cases you haven’t seen before. One thing I’ve had to get a lot better at is teaching other people. We have a lot of new graduates and vet students coming over and we teach them about surgery and about fish poisoning…it has been really good, I really enjoy it. And I love meeting all the vets from around the world, I’ve picked up a lot of tips and tricks and ways of doing things. Thank you Michelle and to to all the volunteers at the EHF who do such a fantastic job.